Something Is Out There...: One Tour Ready To Go. The Other Is Still Shaping Up. One Tour Ready To Go. The Other Is Still Shaping Up. 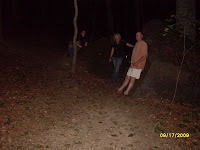 Dave, Sarah, Mike(who took this picture) and I finally made the finishing touches to our YMCA ghost walk tonight. We are quite familiar with the trails down in this area now. Amy stayed at the flag poles and waited patiently for us to return from our mission. I am happy to say this particular tour is finished completely as of tonight. I think anyone who goes on it will have a great time. 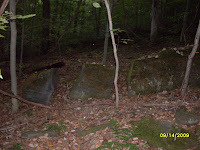 There are several places that are worth a picture, like this boulder that sits on the trail we will be walking on. Mike and Dave pose for a picture on a big rock. We went to the lowest point of the trail we are walking on to do some EVP work. There is one spot on the trail that has some activity on it. But not where we went tonight. We were more reminded of the lair of Bigfoot than ghosts. Traveling on the trails along the Back Nine has been a lot of fun this week. This is Sarah and I two nights ago. Dave took this picture. There are two hills we have to walk up, but the scenery is well worth it. This rock has what looks like a tool mark embedded in it. As it turns out, that is what it is. We are still looking into why there was so much cut stone taken from this area. Did they use it to make the stone pillars that mark the front gate? Or maybe the wall beside the tennis courts? Is that why there is a mean and nasty ghost that spends his time there? 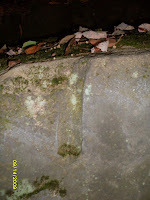 You can see this rock has been split into three pieces. I don't know why it wasn't used. There are other rocks split like this in the same area. This is part of the tour. Now if the Lisbon Tour will just come together like this one did, I can relax. Not happening however. Lisbon seems to be guarding her secrets well. But I still have a week and a half to look. Plus, CCFHV will be at the Johnny Appleseed Festival Saturday and Sunday. Maybe we will find something out there. I sure hope so. We have about 9 stories for the walk so far. I hope there are more. If you know of any, please let me know. Come and say Hi at the Johnny Appleseed Festival too! Hope to see you there!